Two years ago, the media went into something of a frenzy at the news that gaming had overtaken the movie business in terms of both popularity and revenue. But if you think this means the world is now spending its evenings sitting with console controllers in hand playing FIFA and Fortnite, instead of watching the latest Hollywood blockbusters, that is only half the story. The phenomenon of live gaming has increased the popularity of video games among spectators as much as participants. 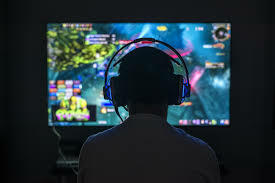 Professional gamers are giving up routine careers to become full time live gaming streamers in much the same way as they used to become singers, actors or stand-up comedians. It might sound bizarre, but the recent news that Ninja recently welcomed the ten millionth follower to his Twitch channel shows that watching gaming streams is anything but a fringe hobby. Like most streamers, Ninja made his name playing the most famous eSports games such as DOTA 2 and Halo 3. However, over the past year, he has been more associated with Fortnite, a game that enjoys enormous popularity, but has yet to really make its mark in world of eSport. This represents an intriguing twist, and demonstrates that the worlds of live streaming and eSports are beginning to take divergent paths. For example, back in 2017, game developer Evolution stated in its annual report that soaring revenues from its casino games had a lot to do with its new live gaming products. Now live casino games are nothing new – they are essentially a cross between online and real casinos, in that you play via the internet but with a live dealer with whom you can interact. But few people expected this to become a popular spectator activity. However, the magic and romance of the casino is something that, it seems, people find hard to resist. Anyone who has visited one in real life knows that standing and watching a high-stakes game from the side lines can be truly compelling. It seems that this also holds true in cyberspace. He might be some way behind Ninja, but gamer Rocknrolla has 15,000 followers on Twitch and another 32,000 on YouTube, purely through streaming his online casino exploits for others to watch and, perhaps, to learn from. The popularity of eSports like CS:GO is already established, but the likes of Ninja and Rocknrolla have proved that people are just as interested in watching other types of live games in action. The possibilities for the future are tantalising. Already, as the worlds of traditional sport and eSport come closer, there are those who are as interested in watching online versions of the NBA or Premier League soccer as they are in following the real thing. But gaming is a broad subject. In future we might be more likely to spend our free time watching online gamers create new and exciting Star Wars stories unfold through the medium of game than to watch the latest movie where the ending is already set in stone.